Alongside the continuing work of the Forestry Commission, this new body will own, maintain and safeguard our forests on behalf of the public. A new, independent public body will hold in trust the nation’s publicly-owned forests for future generations, Environment Secretary Owen Paterson announced today. The announcement formed part of the Government’s response to the Independent Panel on Forestry’s report on the future of trees and woodland. The Government confirmed its support for the Panel’s vision and has accepted many of its recommendations in full. The policy sets out an ambition to expand wooded areas, increase the amount of woodland being well managed, maintain and improve access to our public woodland and improve the economic performance of the forestry sector. I want to put the future of our public forests on a clear and firm footing. Our forests and woodland will remain secured in public ownership for the people who enjoy them, the businesses that depend on them and the wildlife that flourishes in them. A new, independent body will ensure our woods are held in trust and managed for the long term benefit of future generations, nature and the economy. We all care passionately about our woodlands, which is why I share the Independent Panel’s vision for the future of our forests. We have listened to views of woodland organisations, interest groups, businesses and the public and their ideas have also helped to shape this policy. Our woodland economy has the potential to create jobs and growth, and the action plan the forestry industry is establishing will set out a road map to achieve that. Most importantly of all, we need to look after this precious resource. Recent pest and disease outbreaks have underlined that in addition to increasing woodland we must protect what we have and help others to do so. Government cannot and should not do this alone. The spirit of partnership forged by the Panel and more recently during the outbreak of ash dieback must continue, not least because many of the Panel’s ambitions are wider challenges for the sector and society as a whole. People can play an important role in protecting and improving our woodland. Mr Paterson has made tree health a top priority for Defra and has established an independent plant health task force convened by Defra’s Chief Scientific Adviser, Professor Ian Boyd, to bring together the best scientific evidence which will help to address diseases such as ash dieback. The policy published today sets out how the Government is already giving a greater priority to tree health research, including an additional £1 million of funding announced in September 2012. 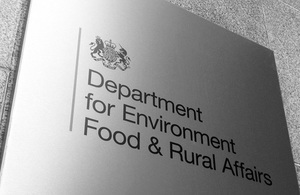 In addition, the Living With Environmental Change (LWEC) Partnership will use £4 million of Defra funding, £0.5 million of additional Forestry Commission funding and up to £4 million additional funding from research councils to do in-depth research into tree diseases to inform the way outbreaks are handled in the future. We have increased the Forestry Commission’s budget by £3.5m next year specifically to make up for lost income from sales of woodland and have also allocated them £2m to recognise additional pressures arising from Chalara and the importance of implementing the commitments in this response. working closely with a range of groups to encourage local people to get involved in managing their local woodlands. Recognising that the public are passionate about their woodland, the Government is also encouraging people to get involved in an innovative scheme to help protect our trees. The Open Air Laboratories survey on tree health, to be launched in May 2013, will give people the opportunity to take part in a major field examination of ash trees for pests and pathogens, including chalara. The Open Air Laboratories citizen science project is led by Imperial College and to date more than 600,000 people, 3,000 schools and 2,400 other organisations have taken part in its surveys. The future shape of the Forestry Commission, as recommended by the Panel, along with its functions and powers will be considered by Defra and the Forestry Commission. This will be done alongside the Triennial Review and Tree Health and Plant Biosecurity Expert Taskforce. Dr Peter Bonfield OBE is Chief Executive of the BRE Group. He will chair a panel of business leaders to create a viable economic, social and environmental future for woodland and forest industries. The plan, Grown in Britain, will have a particular focus on creating market demand for the wood industry supply chain and exploring new market opportunities that will drive new jobs, skills and growth across the UK.